The husband I made a pact to stop calling each other ‘mummy’ and ‘daddy’ in an attempt to rekindle our pre-parent identity. The first hurdle was actually remembering what we used to call each other before I was mainly in charge of the dishwasher. Somewhere in our past lurk names whispered passionately in the dark, murmured down phone lines at 3am, names that in the interests of privacy, I would NEVER share on a public forum such as this (Moneypenny and Batman). OMG HOW DID THAT GET IN THERE? I could swear I edited that bit out. Our pact was going pretty well, except Batman kept calling me “Sair” which has always been my least favourite diminutive of Sara. It’s just not very interesting or committed is it? ‘Sair’ sounds like ‘air’; vacuous, invisible, drifty yet life-sustaining. OH GOD, IS THIS WHO I AM NOW? I blew it a few days ago when, tired and hung over, defenses down, I sighed, shook my head regretfully, and called my husband ”Daddy Pig” in front of some of our closest friends. 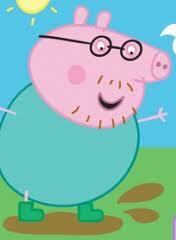 Anyone who has watched Peppa Pig every night for four years will know exactly where this term of middle-aged endearment derives from, but it stopped me in my tracks to realise that Daddy Pig and I have been referring to each other by demeaning diminutives since our daughter came along six years ago. It got me thinking about nicknames and how they can subconsciously reveal what we think about someone. My brothers, for example, call me ‘Boots’ as in ‘Too Big For’ or ‘Bossy’. I like to think this is because they see me as a gently commanding leader figure who is usually right, although they may beg to differ. Older friends call me ‘Perky’ or ‘Miss P’ from my maiden name Perkins. Newer friends call me by my married name, ‘Brannie’ although I have never officially changed it . So, nomenclature wise, I have gone from the commanding ‘Boots’ via the rather saucy ‘Miss P’ to an extension of my husband/ reference to a bowel-movement inducing grain, ‘Brannie’. OH MY GOD. What has happened to me? Who am I? Sticks and stones will cause a nasty bruise and as for words, well, they contain me. I always wanted to be called Astrid, I think it’s time to bring her in before the menopausal ‘Muffin’ takes hold. I’ve overheard some brilliant nicknames accidentally revealed by friends and their partners over the years; Bagpuss, Flap-lighter, Willy-nilly-woo-woo, Betty Boothroyd, Wifey, Boo, ‘Nanas, Pudding, Ninky-nonk, YOU KNOW WHO YOU ARE. What is your nickname and what does it say abut you?